April 9, 2019  NPR's Jackie Northam describes what it was like recently sitting across a courtroom from a man accused of atrocities in Rwanda, 25 years after she covered the genocide. 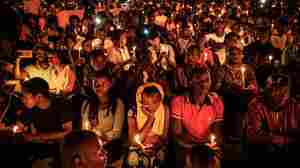 April 8, 2019  This week it will be 25 years since the genocide in Rwanda took the lives of more than 800,000 people — mostly from the minority Tutsi tribe — over a three-month period in 1994. April 6, 2019  Twenty-five years after the start of the genocide in which 800,000 people were killed, a Rwandan man in Boston was convicted for lying on his asylum application about his participation. How Canada Gets Squeezed Between China And The U.S.
March 19, 2019  Canada is under pressure from the two rival powers over the Meng Wanzhou extradition case. March 6, 2019  Meng Wanzhou, a senior executive of Huawei, a Chinese tech giant, appeared at a hearing Wednesday in Vancouver to decide whether she should be extradited to face fraud charges in the United States. March 6, 2019  An extradition hearing for a senior executive of Chinese tech giant Huawei gets underway in Vancouver. The U.S. requested the extradition of Meng Wanzhou for violating U.S. sanction against Iran. February 26, 2019  The U.S. is pressuring allies to bar Huawei equipment from telecom networks, saying the company has strong ties to China's government. Some allies push back saying they can mitigate security risks. February 14, 2019  Loujain al-Hathloul, who opposed the kingdom's past ban on women driving, is among several Saudi female activists who have been imprisoned since last year. Relatives say the women have been tortured. January 25, 2019  The World Bank is searching for a new president after the last one abruptly resigned. The position has traditionally gone to an American, but there could be international competition this time around. Rebranded Trade Deal Gives Member Countries An Edge Over The U.S.
January 22, 2019  Shortly after he took office, President Trump withdrew the U.S. from negotiations for the Trans-Pacific Partnership. The TPP is moving forward, and the remaining members stand to gain economically. January 17, 2019  The department said it "is taking steps to make additional funds available to pay employee salaries." State has 75,000, including nearly 50,000 local hires, most of whom have been receiving pay. 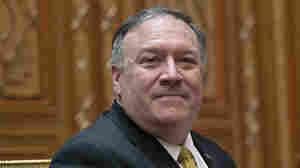 January 14, 2019  Secretary of State Mike Pompeo is in Saudi Arabia — the latest stop in his swing through the Middle East. While there, he met with Saudi crown prince Mohammed bin Salman. What did they talk about? January 11, 2019  While in Cairo on Thursday, Mike Pompeo gave a speech blaming many of the region's problems — in particular the rise of ISIS — on a lack of leadership from former President Obama. January 3, 2019  Saudi Arabia held a hearing Thursday for the men accused of killing columnist Jamal Khashoggi. The kingdom faces charges it's covering up the suspect who ordered the killing. December 19, 2018  The Trump administration is expected to crack down on Chinese hacking in a bid to curb Beijing's effort to be a world leader in advanced technologies by 2025.